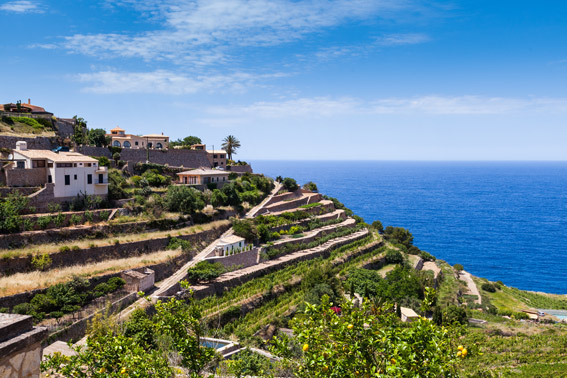 The Serra de Tramuntana is the mountain range that crosses the northwest of Mallorca. Through its 90 km long and 15 km of maximum width, covers over 1,000 km2 and runs through the territory of 18 municipalities. Home to the highest peaks of the island reaching its maximum height in the Puig Major (1,443 m), and contains not only breathtaking scenery of sea and mountains but also a fascinating historical, cultural and ethnological heritage. In 2011 the Serra de Tramuntana was declared World Heritage by UNESCO in the category of Cultural Landscape, in recognition of the harmony between nature and the legacy of human activity. W ere decisive in this statement the dry stone constructions and uniqueness of the water pipes. The first form a unique landscape, whose principal exponent are the terraces to convert steep hill terraces suitable for cultivation. The latter, form an important hydraulic engineering system composed rafts, tanks, ponds and canals that run in balance with the natural network of streams.